Very sunny looking!! Hey, the weather’s not good right now – but oh, wasn’t yesterday divine?! Looking good! 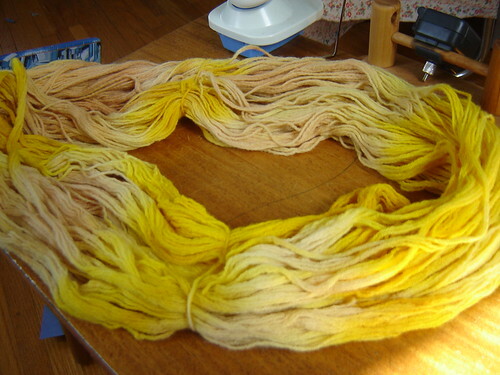 I love the colors you get from natural dyes, they’re just… nicer, I guess. Hard to explain. Have fun with the Baby Surprise Jacket! It’s a great knit. The yarn is looking good. I’ve given some thought to growing some things that I could use for dyeing, but I just don’t have the space. I can’t wait to see your Baby Surprise. The yarn is beautiful! I love that yellow–just right to be a herald of spring. What birth place options are you considering? Conventional hospital? Birth center? Home? Very pretty, and sun-shiney too! 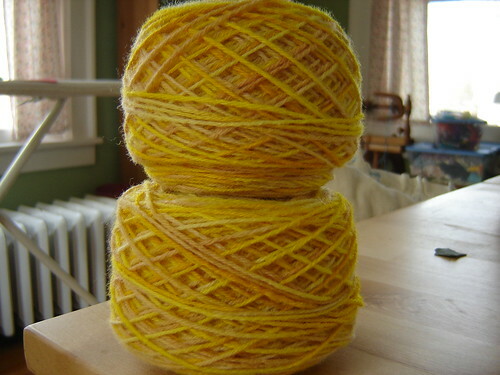 I was thinking how lovely that yellow yarn would be for a baby knit. Wasn’t that storm last night something else? My boys and I were out driving around in it and Puck was a tiny bit terrified. Such sunny yarn! Maybe cute chickie or duck buttons? For the new hatchling to be? 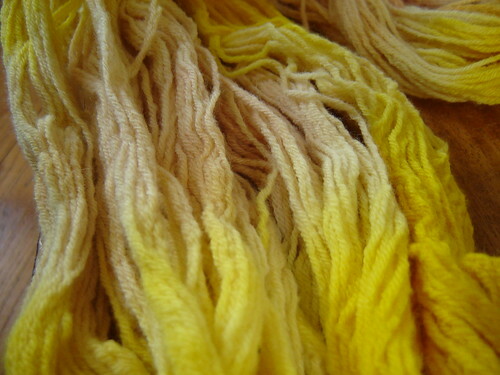 I am so dyeing some yarn naturally- such pretty colors! I have four children. The youngest two are mellower. They don’t cause as much turmoil. Easy going and content as babies and they don’t rock the boat as much as the older two now. Relax. Have you considered the Bradley method of natural childbirth? I took the classes twenty years ago, they were awesome. Your wool is gorgeous! It will be lovely for a baby. Fantastic job on your yarn! 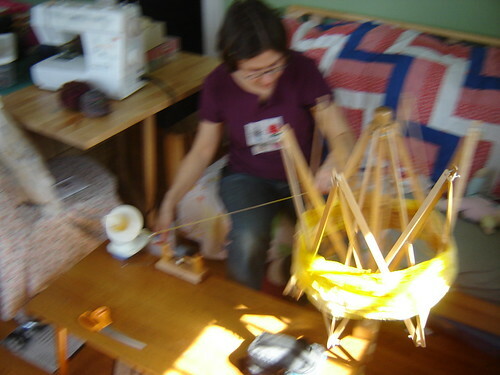 what a warm, sunny yellow the yarn turned out to be – beautiful! We can sure use some warm sunny weather here in the NW – we’re having unusually cold (and snowy!) weather and it’s mid-April! Crazy, I tell ya. That’s a beautiful yellow color – love it!